Dalston Conversation: Residents lay out vision of future at 27 November event. Photograph: Hackney Council. Dalston residents have urged the Town Hall to seize the opportunity presented by major council campaign The Dalston Conversation to win back the community’s trust. The 27 November event, hosted by Hackney Mayor Philip Glanville, saw a range of issues raised, with particular focus given to calls on the council to do its utmost to protect Ridley Road Market and the Eastern Curve Garden. Even the conversation itself came in for scrutiny, from a lack of diversity reflected in the participants, to the format of the evening itself. One Dalston resident, summing up the views at her table, said: “There is a big mistrust of this whole process, based on past experiences, and that’s just a fact. “There’s a feeling that while we’re all sitting in this room having this conversation, that real decisions have already been made or are in the process of being made down in the Town Hall. Now there is an opportunity for Hackney Council to remedy some of that mistrust. “The council can now share some facts and some evidence out about what they are actually responsible for and what they can influence. Information is key. Once residents have some facts, at least we are all better placed to comment on what is possible. A consultation officer responded that the idea was for residents to speak to each other rather than quiz the council for answers. A vote was then held, which carried the day for the existing set-up. Hackney Mayor Philip Glanville also stated that estate-based and youth work would also be carried out through the Conversation process, and that it would not be the only chance for residents to have face-to-face meetings with the Town Hall. 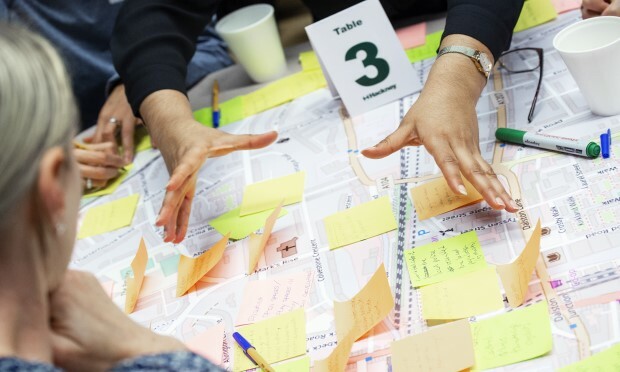 During the event, residents were taken through a series of exercises such as Stop, Start, Carry On (in which they were asked what they would like to see the council stop, start, or carry on doing), and to envision a plan for the area for up to ten years. Participant Kieran Kirkwood pointed out that there was a lack of diversity represented in the room, saying: “This room is particularly white middle-class. That is generally how these conversations tend to go. The Town Hall have stated that the Conversation campaign was launched as a direct response to fears voiced by the community that the council was not supportive enough of well-loved venues such as the Curve Garden in an area which Mayor Glanville described as on the “frontline” of gentrification. The population of the area has gone up 12 per cent in four years, and with the advent of Crossrail 2 linking the town centre directly to north, central and south-west London it is likely to attract further attention from developers. The event threw up a wide range of points from those taking part. Suggestions were made for the conversation to be a continuing process over years, in order to keep up with the pace of change, as well as calls for greater accessibility, strong mental health services, year-round provision for rough sleepers, and for the Town Hall to build social housing at scale. Hackney Mayor Philip Glanville said: “Two years ago, there was a lot of uncertainty about what the council had planned. We were about to embark on the consultation around the Dalston Quarter, and there was so much uncertainty and lack of clarity about where the council stood. “Dalston is a place that is facing the challenge of gentrification more acutely than many other parts of the borough. It is at the frontline of that, with people that are really deeply passionate about businesses, cultural institutions and street markets, and it’s seeing the type of development that can feel quite alienating. Speaking at a demonstration which was held outside the event, Danny Hayward of the London Renters’ Union said: “All around Dalston you can see massive new developer-led flats springing up which people I know around here could never, ever afford.